In the midday hours of April 26, 2003, Aaron Ralston found himself alone in the most dire of predicaments. While climbing through a narrow sandstone slot in a remote corner of the Utah desert, an 800-pound boulder fell on his right arm, pinning him to the canyon wall. Hopelessly unable to extricate himself, he languished under the rock for several days before committing to the unthinkable. With unfathomable fortitude, he used the dull two-inch blade from his multi-tool to amputate his own arm. Freed from the rock, he then walked to safety. Aaron’s story of survival was later made into the movie, 127 Hours. It not only vaunted the human will to live, but reminded all outdoor enthusiasts that something as simple as an inexpensive accessory can swing the balance between life and death. Through a common item within the adventurist’s inventory, few of us will rely on a multi-tool to save a life, much less our own, but they are essential accoutrements all the same. Frequently called upon to perform menial tasks or rescue us from an unexpected mechanical jam, they are employed to do everything from tighten a battery cable to slice salami at lunchtime. 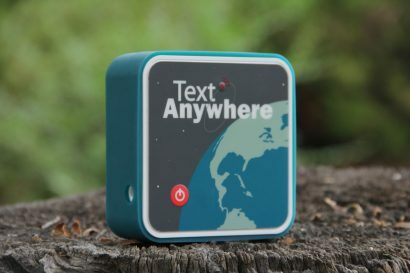 Indispensable and always at the ready, these little pocket appliances have an infinite number of uses. Ubiquitous as they are today, not many people would accurately guess when the multi-tool first came into existence. To arrive at that year, one need not contact the local patent office, but rather read the archaeological reports from the late 1980s when a strange but very recognizable artifact was excavated along the shores of the Mediterranean Sea. 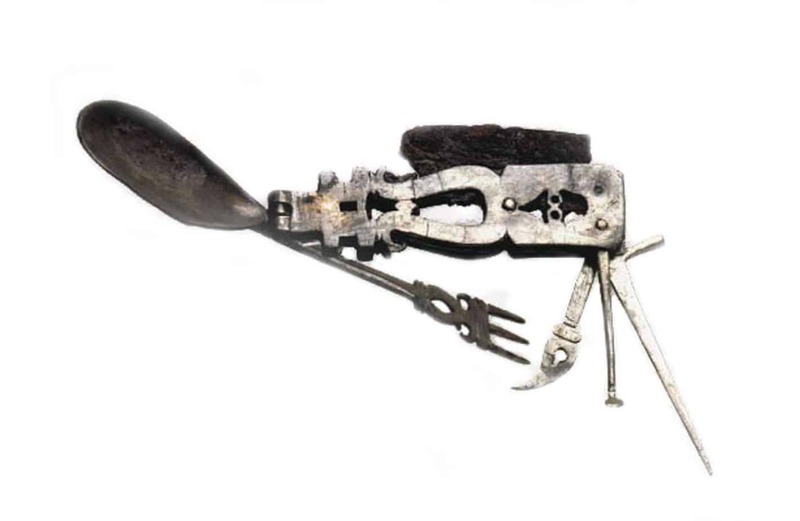 Roman in origin, this multi-tool dated to AD 200 and was determined to be the earliest example of its kind. Given its ornate shape and refined construction, it was most likely the possession of a wealthy traveler or tradesman. The tool was so elegantly crafted the experts quickly deduced that while it was the oldest ever discovered, it was probably not the first. Since the Phillips head screw and other mechanical innovations would not be developed for another 1,700 years, that first contrivance, fitted with a fork, knife, spoon, and hook, was built for the rudimentary duties of the day—eating. As our various tasks and machines became more complex, so too did our pocketable tools. When the age of industry came into full swing, an increasing number of folding devices were made for a wide range of professional and recreational pursuits. 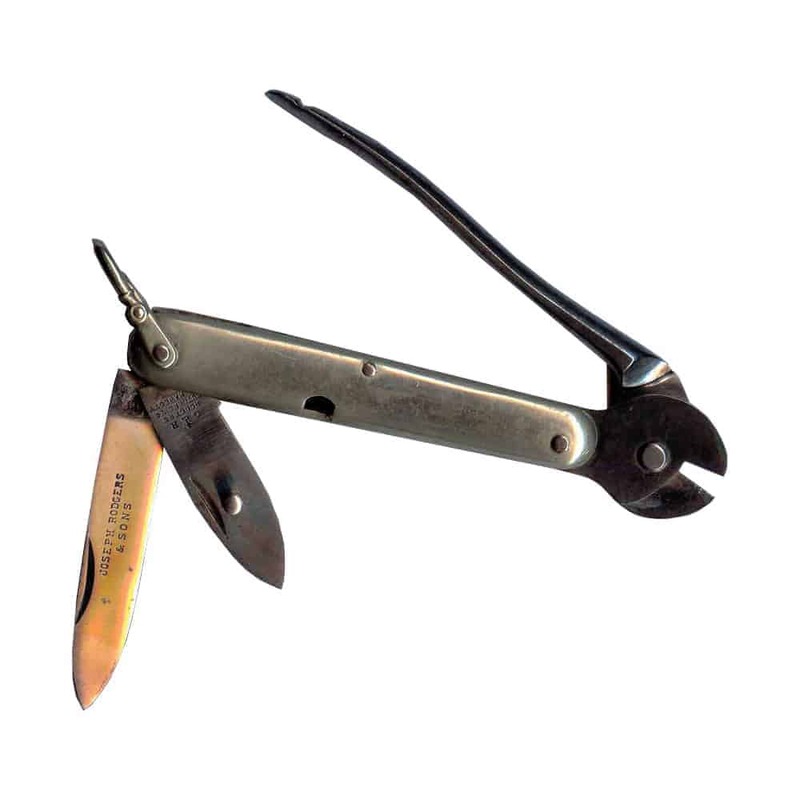 The Barnett plier knife was released by the Oscar Barnett Tool Company in 1900 and sold for the approachable sum of $1.25. 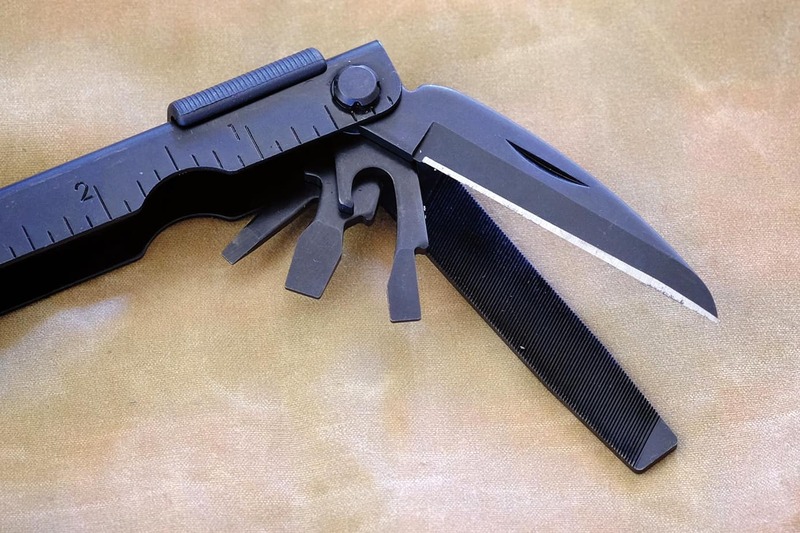 Built around a heavy folding knife and punch, it was amongst the first to feature pliers at one end. To the modern observer, its oversized hook is a curious addition. But in our age of the internal combustion engine, we have long since forgotten about the importance of a proper hoof pick. Other variations designed for anglers, hunters, and musicians soon followed. There were tools made for tuning pianos and stringing guitars, as well as servicing clocks and maintaining firearms. Miners had their own specialized models for cutting and crimping explosive detonators and fuses. A mariner’s version included two of the most useful things a sailor required: a sharp knife and a marlinspike, both essential to rope work and knot tying. 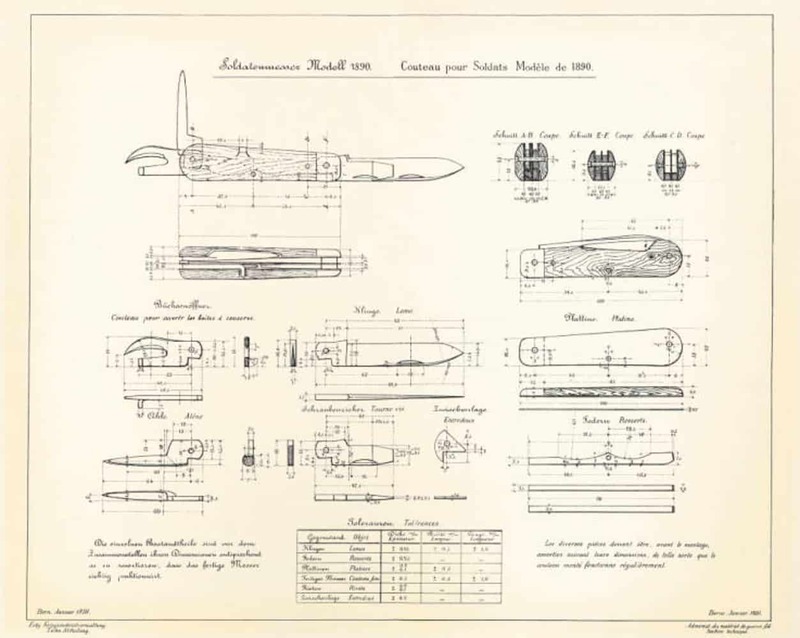 Like all good inventions, the multi-tool was eventually conscripted into military service, the most well-known example being the Swiss army knife. Initially called the Model 1890, a sobriquet indicating the year it was created, it had a blade, awl, can opener, and screwdriver: everything a soldier would need to maintain a rifle, open rations, and perhaps add another notch in his belt when supplies ran scarce. Originally made by Wester & Co. of Solingen, Germany, it was later produced by Karl Elsener under the banner of his now-legendary Victorinox label. Shortly after accepting the contract to build knives for the military, he devised a new model with a secondary pivot, smaller auxiliary blade, and one of the most popular features of all time—a corkscrew. More than 130 years later, the Elsener family continues to produce legendary knives, tools, and accessories. In the greater arc of the multi-tool timeline, one year in particular stands out. 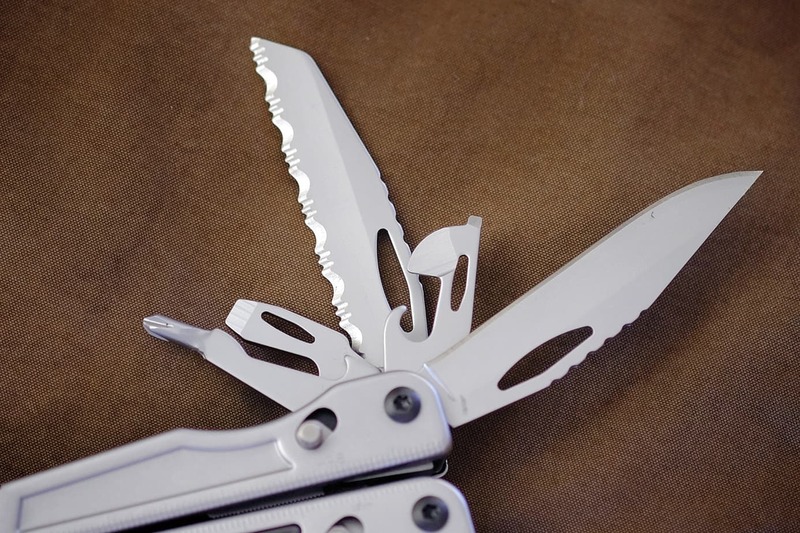 Prior to 1983, most pocket tools were riffs on the folding knife. Aside from a handful of exceptions, like Oscar Barnett’s tool, few had pliers. That all changed when Tim Leatherman went on a vacation through Europe and the Middle East, where he had to continually repair a cantankerous Fiat and leaky hotel plumbing. 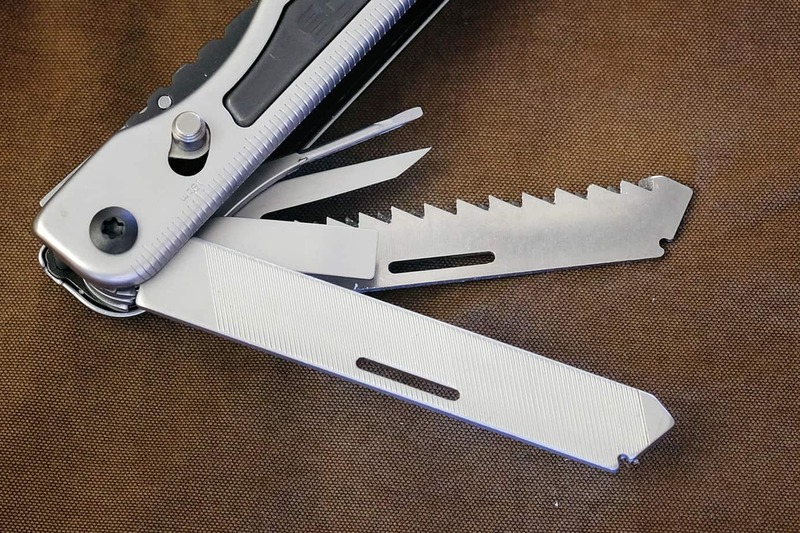 Frustrated with the inadequacies of his trusted Boy Scout pocketknife, and drawing upon his skills as a mechanical engineer, he devised a tool built around a stout set of needle-nose pliers. The rest, as they say, is history. 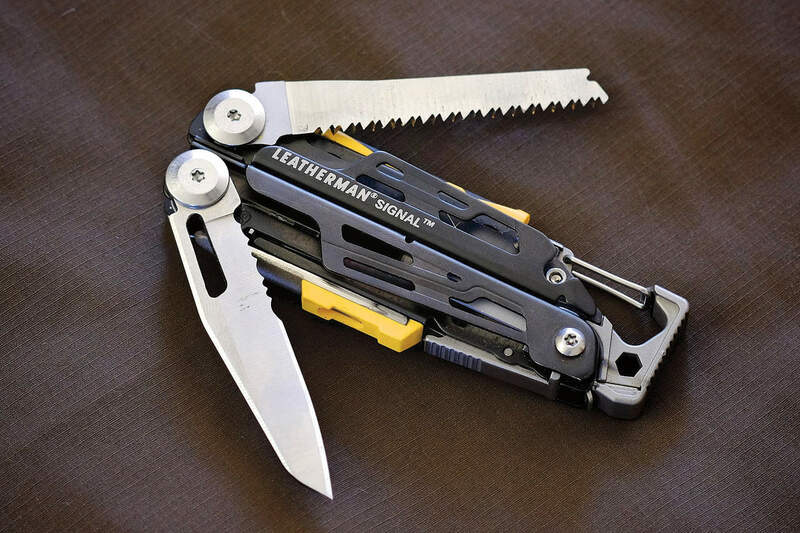 Perfected over a number of years and patented in 1980, Leatherman’s tool was released to the public 3 years later as the Pocket Survival Tool. An instant success, more than 30,000 units were sold by the end of 1984 and 20 million by 2001. 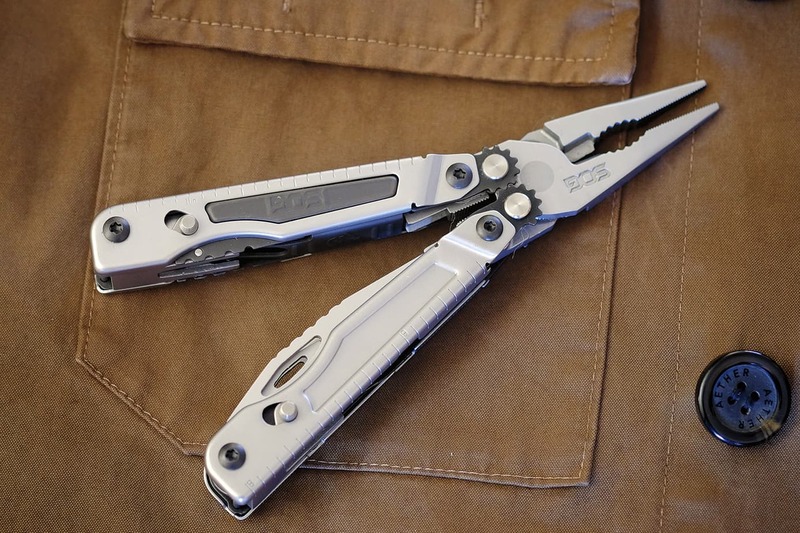 In the years since, hundreds of unique models have been introduced into the marketplace, universally referred to as a Leatherman despite the actual name of their manufacturer. 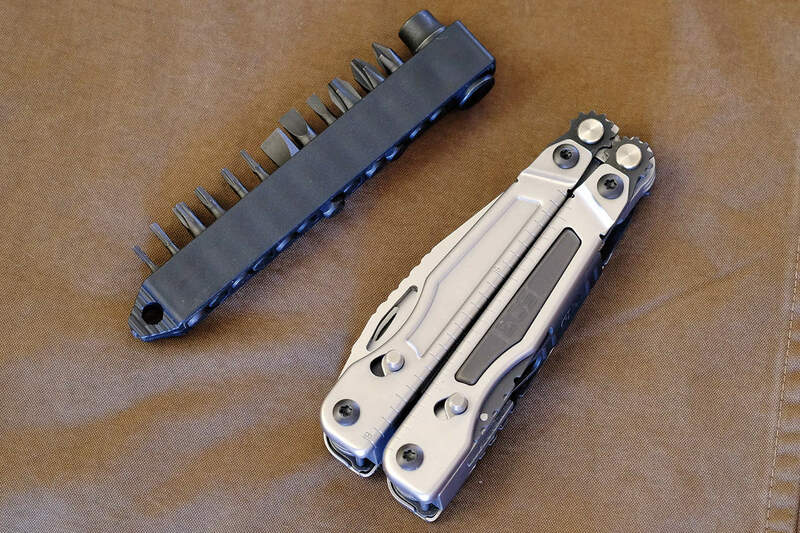 Popular stocking stuffers and Father’s Day gifts, hundreds of millions of multitools are now in circulation, some of them probably still fixing Fiats. With so many folding tools in use around the world and orbiting high above it, stories of them saving the day abound. 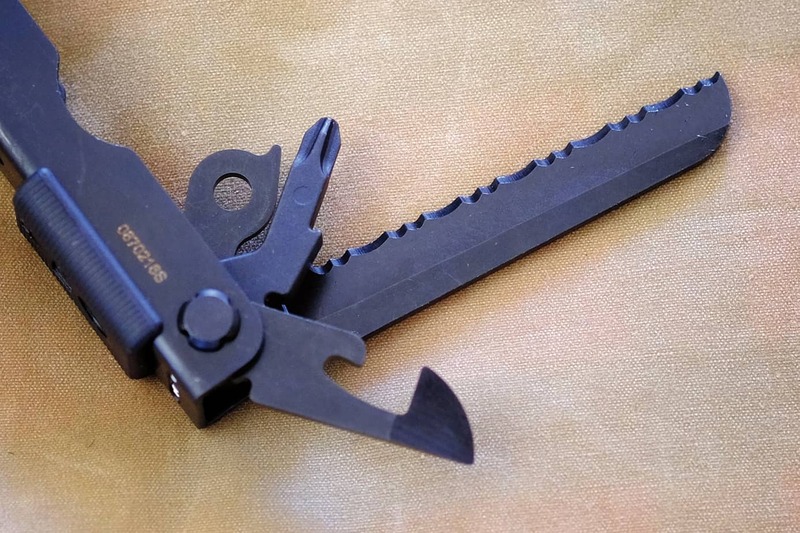 Commonly used by search and rescue teams, law enforcement, and military personnel, the multi-tool has been instrumental in everything from repairing critical communications equipment in natural disaster zones to dismantling roadside bombs in combat theaters. Ask anyone who owns a multi-tool and you will invariably be told a story of a mechanical mishap narrowly averted. 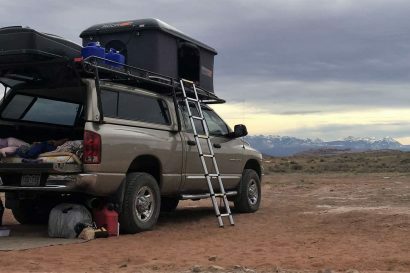 The Overland Journal team has used these pint-size toolboxes to repair kayak rudders in the Sea of Cortez, fix throttle cables in the African bush, and stitch up a torn tire casing on the side of a remote trail in Nevada. Amongst the device’s most ardent advocates are people like NASA astronaut Scott Kelly. After spending a year aboard the International Space Station, he said the two most critical items he brought along were his watch and his multi-tool. 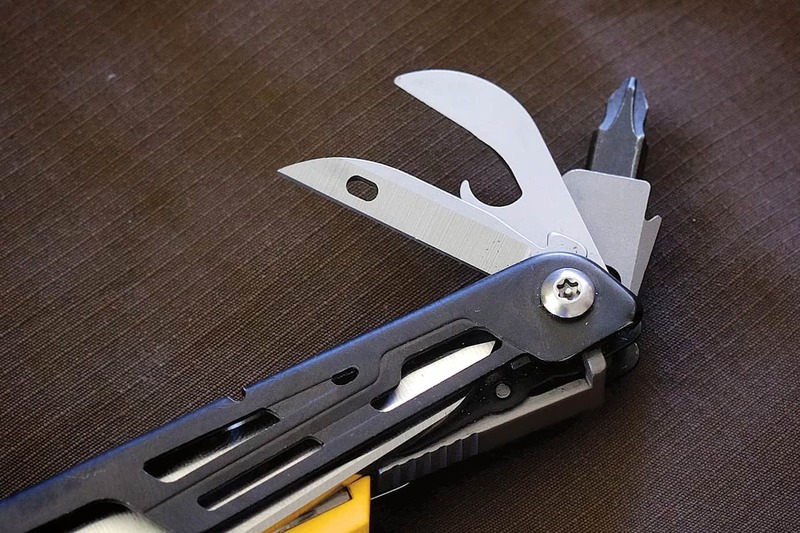 Within our ever-evolving list of essential gear, the multi-tool never fails to make the cut. From the Roman Empire to the edge of outer space, it has proven to be one of our most useful technological advancements. If you’re still not convinced, ask Aaron Ralston. 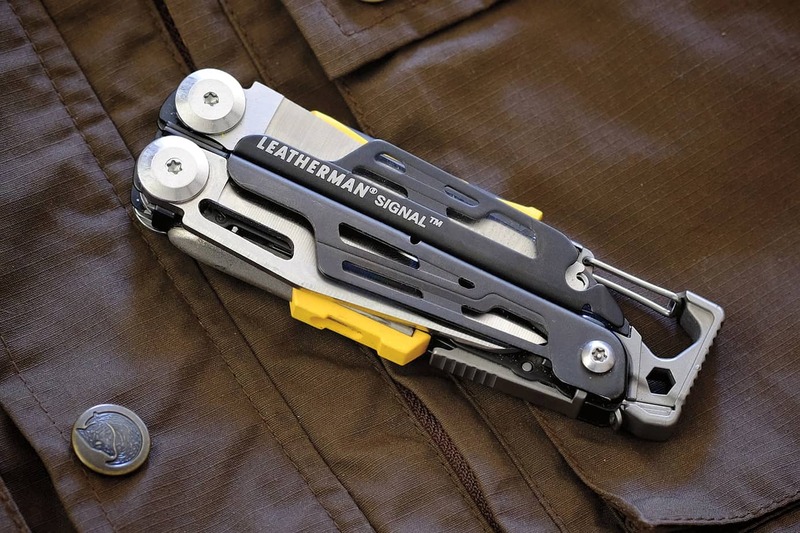 With more than three dozen tools in the Leatherman catalog, the Signal was specifically engineered for the outdoor enthusiast and has a number of features ideally suited to solving any number of backcountry problems. Or more specifically, remote emergencies. 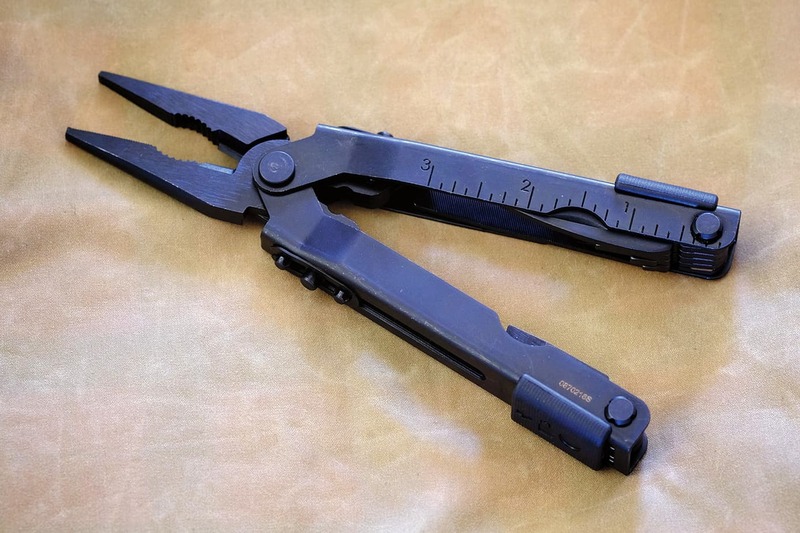 Like the Pocket Survival Tool, it is built around needle-nose pliers made of hardened steel. 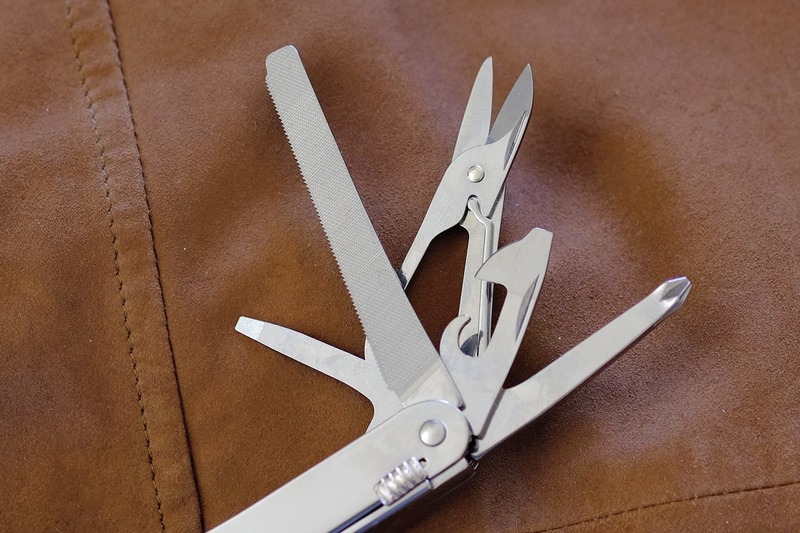 Within those pliers are replaceable wire cutting blades and heavily knurled jaws. At the opposite end is a cast aluminum assembly with an integrated carabiner clip and a blunt striking surface that can be used as a hammer. Inside the handles are five individual foldout tools that include a can/bottle opener, awl, saw, and knife blade made of heat-treated 420 high carbon stainless steel. Both the saw and knife blades are backed with locking mechanisms and can be deployed without opening the main assembly. 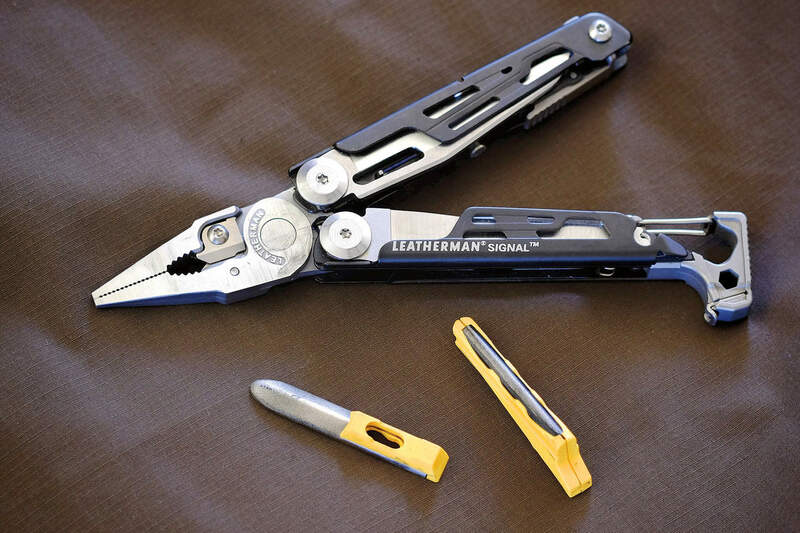 True to its namesake, the Signal is equipped with a removable emergency whistle and a ferrocerium sparking rod. In a desperate scenario, the ability to light a fire can be a lifesaving variable. A detachable diamond-coated steel can be used to sharpen the main blade and serrated edge. It also has a stainless steel pocket clip and lanyard loop, and comes in a nylon carrying case. 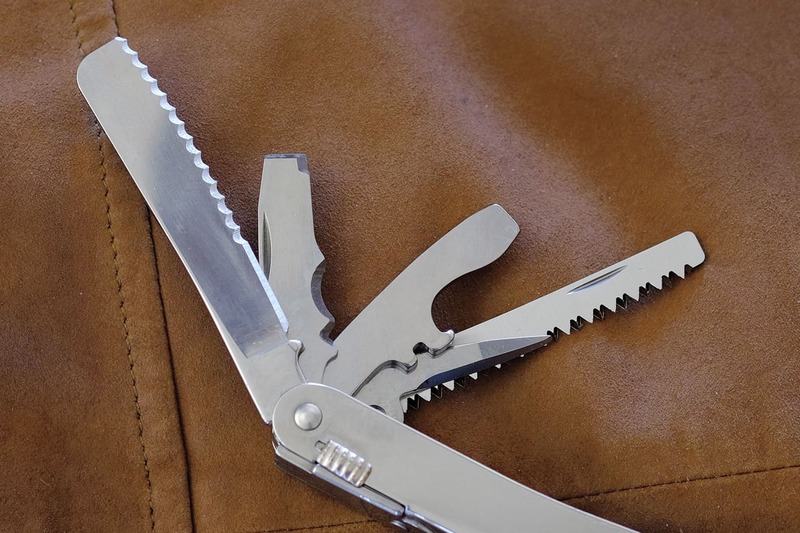 The Swiss are best known for exemplary instruments, and the Victorinox SwissTool Spirit XC Plus Ratchet provides no better example of the brand’s unwavering commitment to craftsmanship. Made exclusively of stainless steel polished to a high sheen, the Swiss- Tool contains a comprehensive collection of implements ideally suited for small mechanical problems. Built around needle-nose pliers with hard and soft wire cutters, the central pivot is machined with exactitude and is impressively smooth. Unfolding the tool around the pliers, it is impossible to not notice how tight and precise the hinges are and that the handles snap into place with a positive click. Within the handle bodies are 10 individual utensils including a file, can and bottle openers, awl, serrated blade, saw, chisel, and four screwdrivers. Like most of the knives and tools offered in the Victorinox line, the Spirit has the brand’s much-loved, razor-sharp scissors. The thoughtful layout of the design allows for each tool to be deployed without first unfolding the handles, and piano key-style locking mechanisms hold each implement securely in place. The lock release is easy to operate, even with gloved hands. 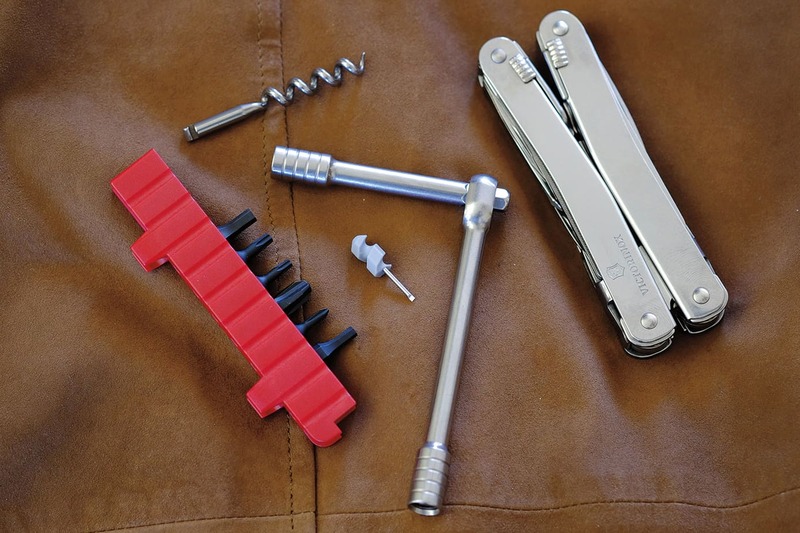 Inside the heavy leather case are additional tools including a corkscrew, jewelry screwdriver, and a miniature ratchet set complete with extension and six hardened steel bits (Torx, Allen, and Phillips). 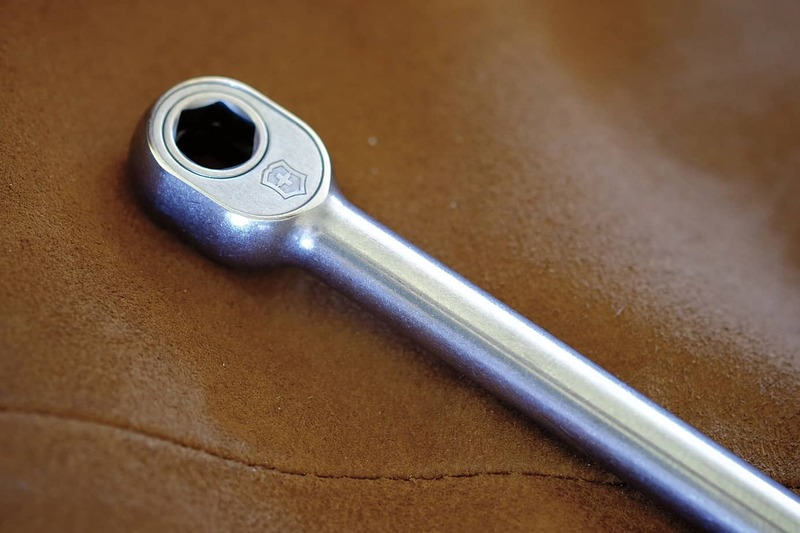 The ratchet is meticulously crafted and has 36 detents allowing it to be effectively used in confined spaces. With the additional accessories, the Spirit can perform 38 functions. 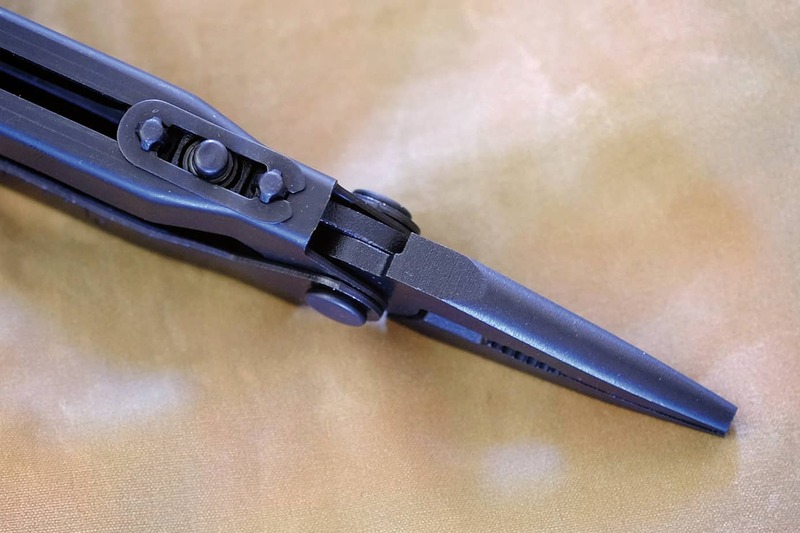 Otherwise known as Special Ops Gear, SOG has always had a close connection to the military and understands the demands combat service places on their tools and knives. They know a poorly executed tool could have disastrous consequences, so extra attention is paid to the design and quality of their products. The PowerPlay, which has 19 functions, is one of the newest offerings in their lineup. 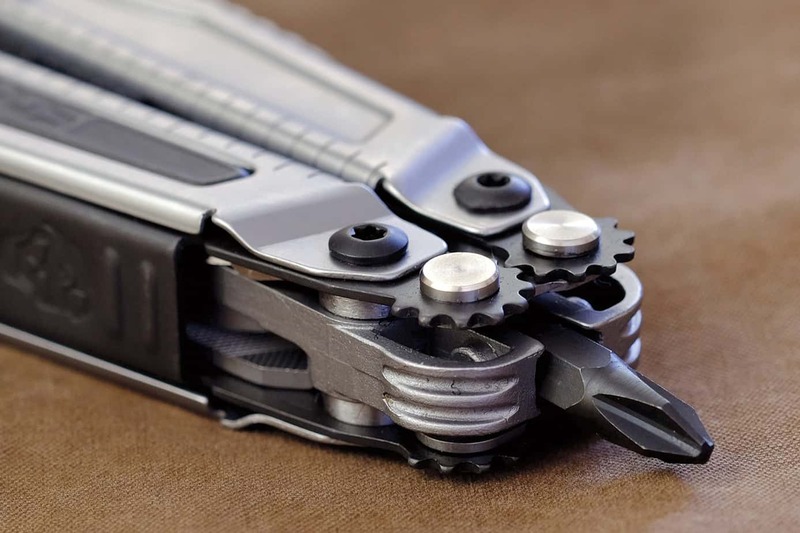 A standout element to most SOG multi-tools is the innovative main pivot mechanism on the pliers. Their proprietary Compound Leverage technology utilizes multiple gear-stabilized pivot points to double compression power, resulting in sharper wire cuts and less hand fatigue during heavy use. The cutters can apply enough force to cut through a coin, and the narrow point of the jaws fit within tight confines for tasks that demand a high level of dexterity. Unlike other tools, the implements within the two handles are placed asymmetrically. The straight and serrated blades, screwdrivers, and can and bottle openers are accessed without unfolding the main assembly and lock into position. On the other handle, a saw, file, awl, jewelry screwdriver, and large flat-head screwdriver face inward and can only be unfolded with the tool in the open position. This places the most commonly used functions at the ready and protects the other tools within the handle body. Inside the durable nylon carrying case is a rubberized holder with 13 steel bits (Allen, Phillips, and flat). 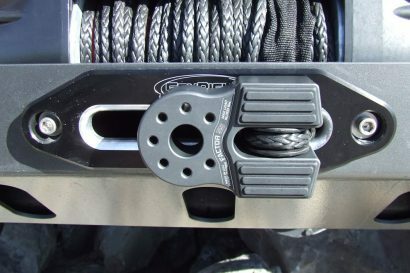 Taking advantage of the PowerPlay’s main pivot, the bits fit inside a small receiver in the inverted plier assembly and are held fast by the strong bite of the Compound Leverage system. One of the challenges with many multi-tools is accessing the pliers, a process that typically requires two hands. 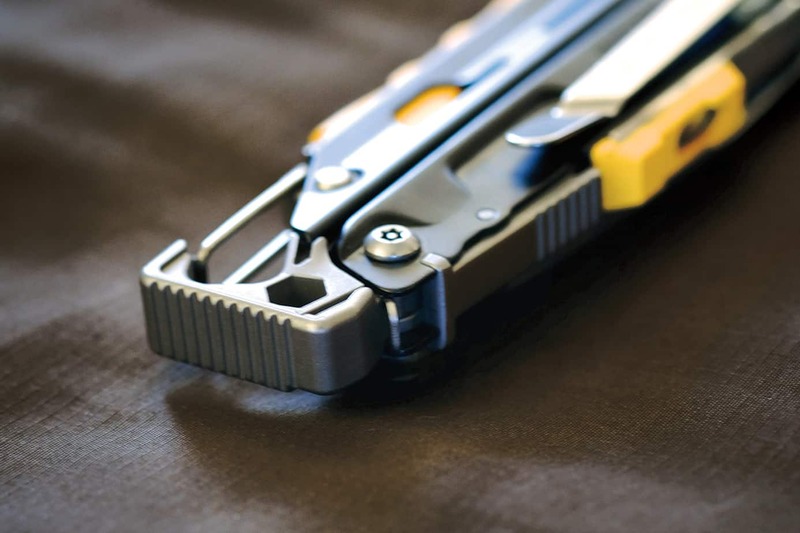 The Gerber MP-600 solves this nagging conundrum with a clever mechanism that allows the plier jaws to extend from within the handles in one fluid motion. 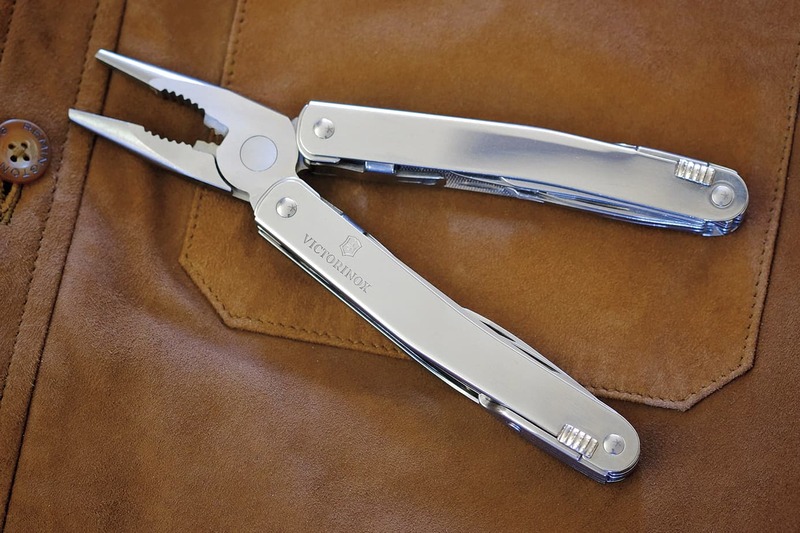 With a simple flick of the wrist, the pliers slide forward and lock firmly into position. Retracting them is also a one-handed operation, achieved by depressing two lock releases and pushing the pliers back inside the tool. 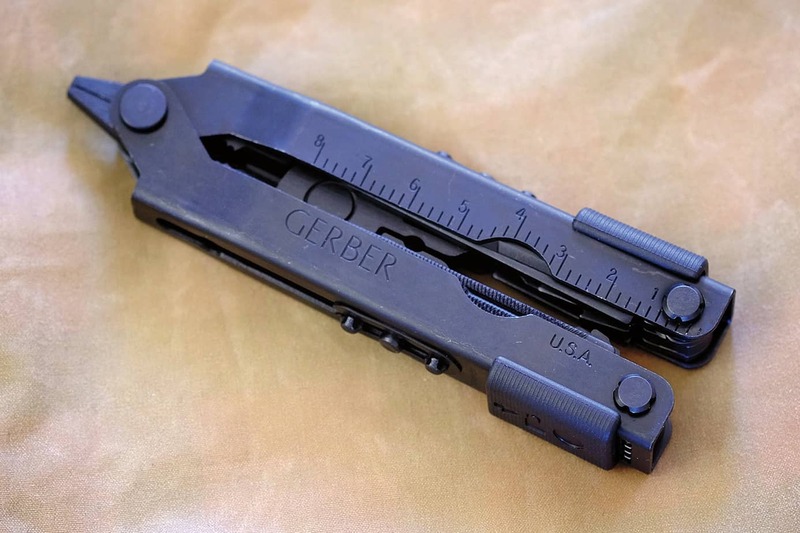 The most popular tool in Gerber’s inventory, the MultiPlier has developed a patriotic following due to its Made in America origins and common usage by various entities within the U.S. military. Constructed of solid stainless steel and powder coated with an anti-reflective black finish, only the lock releases are made of high-density plastic—but have proven durable enough to endure the most abusive combat duties. Used extensively in Iraq and Afghanistan, the MP600 has survived roadside bombs and other assaults that have destroyed lesser tools.